For September’s update I’ll be discussing a piece of abstract art from my past, present, and future. Size: 48 in. X 48 in. 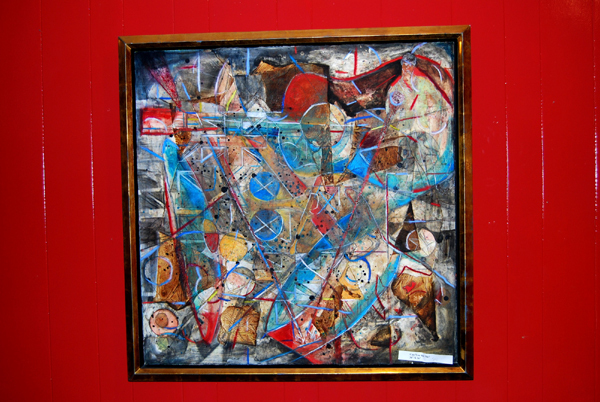 This painting was the second abstract mixed media painting that I have created. I was building up ideas with simple shapes as well as a few musically inspired concepts. At the time I was listening to the Who in heavy rotation. The dynamics between Pete Townshend and Keith Moon inspired me to explore a sort of “controlled chaos.” I liked the idea that you had a really tight structure set in contrast to a loose and chaotic musical base. In a lot of ways this still informs my initial approach to my paintings. This painting actually was supposed to end up a full drawing. I purchased the arches paper from the local Art supply store in Savannah. Once bringing it to the instructor, I had found out it was fairly short of the requirement for the assignment. As a compromise I asked my instructor if I could glue the paper to a canvas and create a mixed media piece. She agreed and the foundation for my current work was born. We were instructed to begin the painting by pouring a base color. I did this a few times over the course of a weekend. My roommate at the time kept inquiring as to why I was doing this and leaving a canvas drenched over night. I had no idea how it would turn out. Luckily, I got a really wonderful patena that served as the ground color. From here I built an armature for the painting by using a set of drawings, including a guitar, a bass drum, and various Who related imagery. From here watered down acrylic paint was set in certain areas with a brush to set a basic color scheme. I then took a que from the techniques of illustrator CF Payne and added a thinned out layer of black oil paint. This was to set up instant value contrast. If you look at his site and wonder how I took influence from him, it makes some sense. His work is hyper realistic, but I still took some major steps of his process and made it my own thing. From here I added chalk pastels. Brightly colored chalk pastel set next to a neutral or dark color creates a very intense visual effect. This painting sold to the Hayslip Design Associates corporate collection. This painting has lead to multiple commissions including “Puzzles and Games”, “Road to Rhodes”, “Lions and Tigers” and “Balance” among others. I created these two commissioned paintings between February and April of 2017. 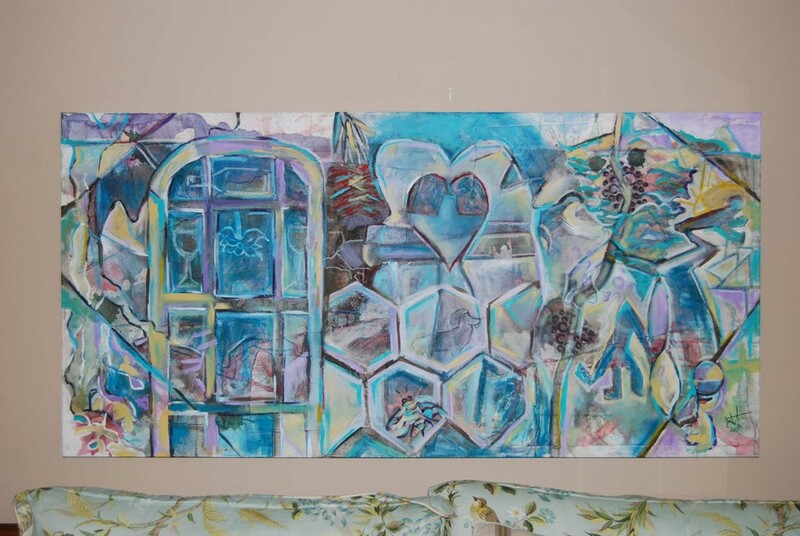 Andrea and Jim Lovelace were commissioning this painting for their home in League City, Texas near Houston. I had discussed various ideas with the client in person and over the phone prior to getting a head start on these paintings. These ideas included but were not limited to their interests as a couple, the colors within their home, and various things found within their yard. They wanted to capture the essence of the life they share together in their home. I had gotten to a point where I was very controlled with my work. The first painting was an attempt to loosen up and not overthink what I was working on creating. I initially sent the first painting with a very laid back and relaxed mentality. This also reflected the energy of their home. It was a great way to lighten up my approach. The first painting turned out very strong, and we decided to go ahead and try a second painting to see which would turn out to be the right painting for their home. Jim and Andrea decided that they wanted the imagery to be slightly more hidden. One of their favorite aspects of my artwork is that the viewer has a puzzle to decipher. I had not set out to intentionally or unintentionally accomplish this with the first painting, but we both broke down what they liked and what needed to be changed when creating the second painting. So I set out to take the strongest elements of the first painting and adjust the color scheme based on what we discussed after they viewed the first painting. I made some conscious editing choices and simplified some elements. In some instances when creating a commission painting I sometimes have a favorite. However, I like these two paintings in equal measure. We ended up with a great second painting that now sits proudly above the mantle in their bedroom. The second painting was ultimately sold. 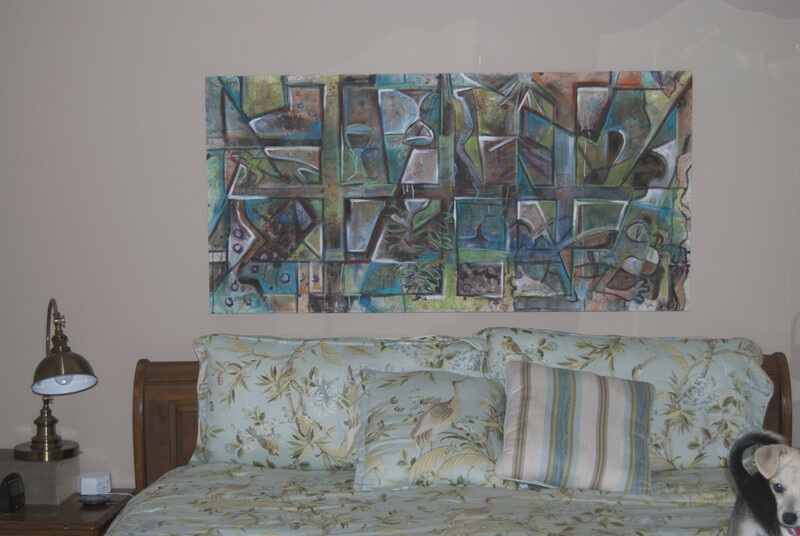 The first painting on the left is currently available for sale. These paintings are the culmination of my most recent efforts. I am continuing my exploration of the human figure. As these paintings developed I made every attempt to usurp my usual process. I thought, “what would I usually do at this point?” and try to think of some way to either go a different direction of find a fresh approach. I am about 80%-90% complete with these paintings. At the suggestion of the subject of the painting I am rendering the full face of the individual as a form of contrast/dramatic shift in the composition. This painting has become more about mood, space, and a sense of calm. There may still end up being a few more minor references as well as a completed semi-realistic rendering of a portion of her face in the middle. The painting on the left has taken on a bit of a life of it’s own. 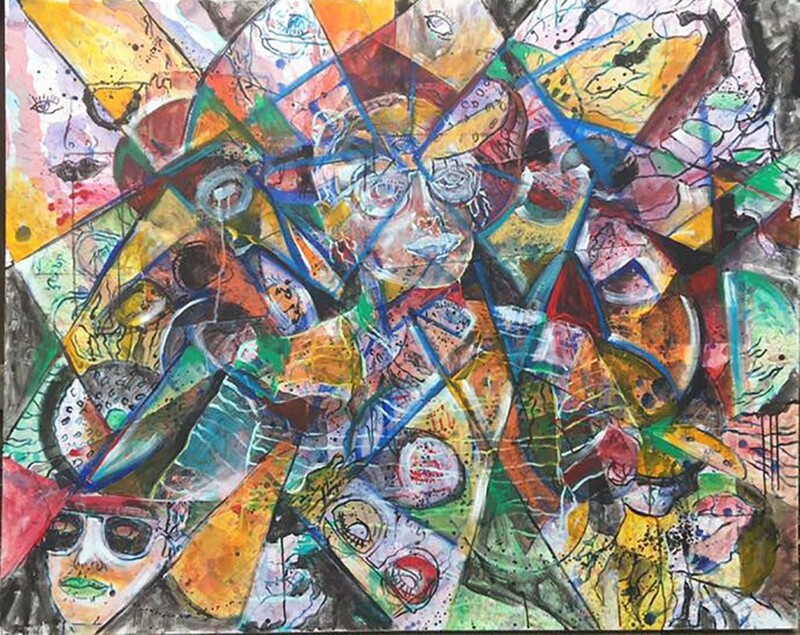 There is still a sense that the figure is very grounded among the visual chaos. At this point, it almost gives me the impression that the subject is existing in some sort of astral plane or dream state. This painting became more of a study in geometry and color. A lot of the imagery in these paintings are personal to the subject. They relate to everything from her nature as a Scorpio to her youthful spirit. My thought process was to explore how a person can maintain a positive outlook despite surrounding chaos. It’s a testament to her resilience and creativity. There’s also a significant surrealist influence on this painting. These paintings have been a ton of fun to make and I really want to thank Jacqui Sommerman for working with me on these paintings!